its coffee beans: just go to Zeke's for coffee from all over the world, and you will probably find their sustainable single-origin Papua New Guinea blend. Discovery and Travel Channel-worthy shows such as Living with the Mek with gorgeous Brit adventurers Mark and Olly. In terms of its cultural diversity, Papua New Guinea is pretty diverse considering how relatively small it is: about 1,000 cultures in a country of about 6,000,000. So there is really no one cuisine of Papua New Guinea. Instead, there are many common ingredients. Taro and yams are indigenous to Papua New Guinea, and were supplanted by the sweet potato about 300 years ago (introduced from South America). Yucca also came to Papua New Guinea from South America, but sweet potatoes are now one of the most popular crops. Even though Papua New Guinea has no easy-to-pin-down "cuisine", some have tried to find one. The University of Papua New Guinea just put out a cookbook last month of the Papua New Guinea Cook Book. 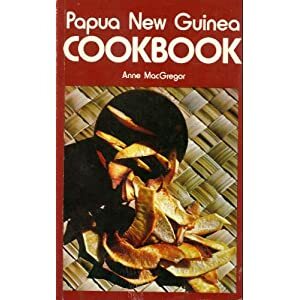 Edited by Louise Shelly, many recipes are in English, and a few are in another one of the country's common tongues, Tok Pisin, Before that, one notable cookbook among them is by Australian author Anne MacGregor, who penned the extremely rare (and now extremely expensive) Papua New Guinea Cookbook. It's not available in libraries, and the only ones you can buy cost $100 used. Maybe easier to find in Australia or, say, Papua New Guinea. But as a grad student out in Cali, I found a copy of MacGregor's cookbook in the voluminous University of California library and made a photocopy of a few recipes here and there. This is pretty much the only way I can try these recipes, much less share them with anyone. Number of Papua New Guinean restaurants in the Baltimore area: You're kidding, right? Number of Papua New Guinean restaurants in the DC area: 0, though there is one embassy (for all of the Americas) near Dupont Circle. This is it. This is all I needed. The rarity of Papua New Guinea recipes in the US or on the internet is made up for by the relative cheapness of most of Papua New Guinea's ingredients. Including the bamboo skewers, I spent all of $5 for enough kaukau na painap to fill me up for a week. It showcases one of the most important staples of Papua New Guinea: the sweet potato (again, not the same as the yam, which is also common there), and in a very tropical way no less. I got some sweet potatoes cheap at the produce stand on Joppa Road for all of 75¢, and ended up using only a few of them. I am now up to my eyeballs in sweet potatoes. The pineapple was only $2.50. I bought it pre-cut because, for some reason, it looked like Wegman's was selling whole pineapples for $7! Maybe I misread something, because I later saw one at Whole Paycheck Foods for half the price. Maybe Wegman's pineapple was organic? Since I had butter on hand (note to self: buy more butter), the only other thing I had to buy was a package of skewers, which set me back $2 at Giant. I wanted to grill the kaukau-kebabs outside, but I didn't have a lot of time when I did it, and it was somewhat crappy outside anyway. So instead I got out the cast iron griddle instead. Partially boil (I did mine for 10 minutes - the key is to undercook them), peel and cube the sweet potatoes. I did it a little bass-ackwards, first peeling, then cubing and finally boiling them. I didn't do perfect cubes, but cubes will make it easier for them to fit on the grill. Next, skin and cube the pineapple (or buy it pre-cubed like I did, as noted above). Skewer the sweet potato and pineapple - and remember to soak those skewers first! Next, melt the butter and brush it over the skewers. Or you could go bass-ackwards again, and dip everything in butter before skewering. It's messier but I didn't have a brush so it was a bit easier for me. Grill until the sweet potatoes are nicely browned. I was impatient so I didn't do it as long as I wanted. I added a little salt to one and a little chili pepper to the other. Perhaps this should be a no-brainer sort of recipe, but it wasn't. I hadn't really considered pairing sweet potatoes and pineapples together. Despite the textural differences, the flavors blend nicely. In fact, what I may do with the remaining sweet potatoes and pineapple cubes is to purée them together with some butter and a wee bit of salt. I'd guess it's been done before, but I haven't seen it yet. Sweet potatoes + pineapple + marshmallows = traditional Thanksgiving casserole. It takes the traditional casserole from "sweet" to "super sweet" but somehow the texture of the pineapple (use crushed) adds something, as does the tang.